Area crossed by an aircraft to enter or exit a parking spot. Lane used by aircraft for entering or exiting the maneuvering area. Lane reserved for airport service vehicles. Lane used by aircraft for entering and exiting the apron. Lane linking the landing runway with a taxiway that is used by aircraft after landing to free up the runway. Glassed-in office where the air traffic controllers coordinate aircraft movement such as takeoff, landing and flight. Structure supporting the control tower cab, which provides a wide view of the runways and terminals. Lane used by aircraft for entering or exiting a takeoff or landing runway. Part of the network of roads serving the airport. Structure through which passengers pass before or after their flight to pick up or leave their baggage and to go through customs. Structure where aircraft are maintained and repaired. Area where aircraft park between flights for maintenance or overhaul. Pavilion for passengers to reach aircraft that is linked by an underground corridor or by vehicles with the main terminal. Yellow line painted on the ground that shows aircraft the route to follow on the apron or the maneuvering area. Underground corridor linking the main terminal with a radial passenger loading area. 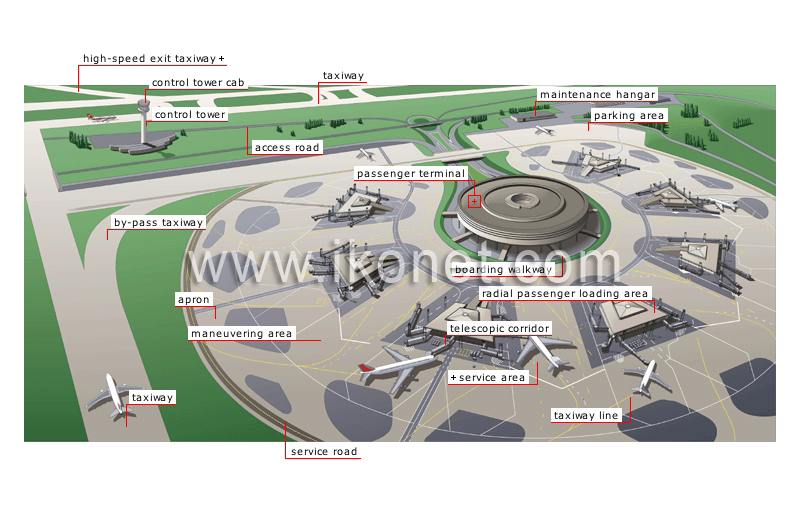 Area around an aircraft that is reserved for service vehicles and ground crew attending to arriving or departing aircraft. Mobile corridor connecting the passenger loading area with the aircraft.